The Australian Tax Office (ATO) research indicates 65% of small businesses found that managing cash flow was a big concern for their business. Being profitable does not make your business immune from the challenges caused by cash flow. Over the last twenty years I have worked with businesses who have been profitable every year and continually struggled with cash flow problems. This means they are funding their business through external means, for example, owners funds, delaying payments of tax, super or creditors or increased debt. Cash Flowocity is our unique way to describe how cash flows in a business. Using a river as an analogy for cash flow. We know that water follows the path of the least resistance. The way cash moves through a business is similar. It follows the path that is created by its systems, strategy, structure and culture. The amount of water that flows down a river is made up of two components - strength and speed. We know this is true of cash flow as well. Therefore, we define Cash Flowocity as the strength (flow) and speed (velocity) that cash flows through a business. Strength is the width and depth of a river. If the river is deep and wide it has more stronger and doesn’t require speed if the flow is constant. Strength is how much of every dollar of sales makes it to the bank. Speed is how fast the cash is flowing in the business. The time it takes from the purchase of the product or provision of the service till the money reaches the bank. Another example of strength and speed can be found in monopoly. Monopoly is a great example of how cash flow is just as important than profit. Strength is how much of the $200 you have after going around the board once. Sometimes you will go around the board and you will make more then what you spent. Speed is the average number of throws it takes to go around the board. If you are losing money every time you go around the board, the quicker you go around the board the quicker you go broke. Sometimes it is better to hide in jail. This happens in some businesses as well. The more they sell the more money they lose. We worked with a business that had no stock controls. They wanted to please every customer. When a customer asked for an item and they didn't have it in stock, they would go to the wholesaler and buy the minimum amount of stock. Sometimes the minimum was 100 pieces and the customer only wanted 1 or 2 pieces. They would then have 98 pieces sitting in stock. This poor control caused stock to blow out to over 500 days turnover. We use the quadrant above to identify where strength and speed fit in the model. The optimal quadrant is the upper right which identifies high speed and high strength. If your business is any other quadrant your goal is to move towards the upper right quadrant by focusing on the activities of the component that is causing the cash flow issues. Low Strength, Low Speed – This is the failure zone. A business cannot survive if cash flow is weak and slow. Low Strength, High Speed – This is the business that is always churning. They are always chasing the next sale to get money in the bank. If sales growth slows then the business will move into the lower Failure quadrant. 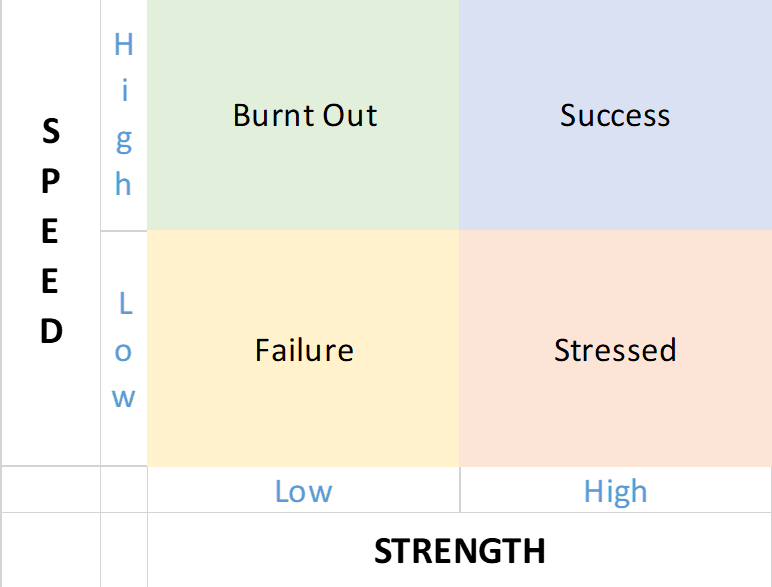 Their goal is to increase strength to move to the success quadrant. High Strength, Low Speed – This business is profitable; however, they have problems paying bills. E.g. A business in construction industry - the projects that they are completing are profitable, however there are delays in collecting money. Businesses in this quadrant are stressed as systems are not functioning. High Strength, High Speed – The business is the goal of all business. Cash Flow is the ultimate measure of how a business is being measured. Before you start trying to fix your cash flow problem, identify the source of the problem. Increasing sales is not always the answer. If you want help cash flow then contact us today on 1300 854 705 or click on the Get In Touch button below.